Whenever two birds start acting hostile to each other, I get excited and immediately set my gear ready to catch some action. 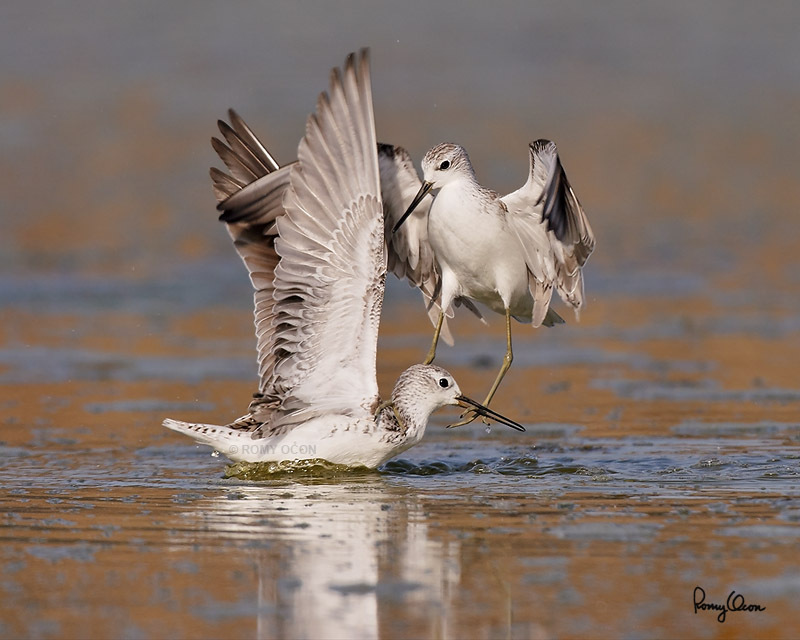 One of these Marsh Sandpipers was foraging at a fishpond when the other flew in to share the bounty. The first bird apparently didn’t welcome the incursion and a feathered fight is on. I let go of a burst until the 20D’s RAW buffer was full. The duel lasted just a few seconds and all I saw in the viewfinder were flashes of bright feathers and splashing water. It was only when I reviewed the shots on the camera’s LCD that I noticed one of the frames caught the combatants in a peak moment – one bird’s toe was caught in the other’s beak. These birds are uncommon migrants to our islands. They are of medium size, with a length of circa 9.5 inches. Habitat – Uncommon, in marshes, ricefields, and fishponds in shallow water rarely on exposed mud and coral flats. Shooting Info – Sta. Cruz, Zambales, Philippines, March 7, 2006, Canon 20D + Sigmonster (Sigma 300-800 DG), 800 mm, f/9, ISO 400, 1/1600 sec, manual exposure in available light, 475B/3421 support.